A new selection of Enthoo Pro-series Chassis and a brand new PSU range aren't the only upcoming products Phanteks have brought to CES 2018 in Las Vegas this week. Joining them are a wide selection of RGB LED lighting accessories, incorporating Digital RGB control and compatibility with existing LED control schemes. The centrepiece of this new range is the somewhat unassuming Phanteks Digital-RGB controller. With this module each LED in a supported strip or component can be controlled individually, and set up to cycle through more patterns and colour modes than ever before. Control is via a three-button remote, and works without the installation of additional software. Additional control is available by interfacing with motherboard-based control systems such as MSI Mystic Light and ASUS AURA, through which it's also possible to sync the lighting with other RGB components. The D-RGB Controller hub has magnets integrated for quick placement within the chassis, and the cabled remote can be placed almost anywhere thanks to an included velcro tape. Complementing the D-RGB Controller hub is the RGB/D-RGB expansion module. This small accessory can add two further digital RGB channels and two standard RGB channels, adding a total of eight D-RGB components and 5 metres of RGB LED strips. As with the Controller, it's possible to sync them across a range of RGB control schemes. Alongside the control modules comes Phanteks branded LED lighting strips. These Digital-RGB LED strips come in packs of two, each 40cm long, with magnets and 3M adhesive tape to let you place it anywhere inside or outside your system. The solicone housing is waterproof and strips can be daisy-chained for more elaborate lighting setups. 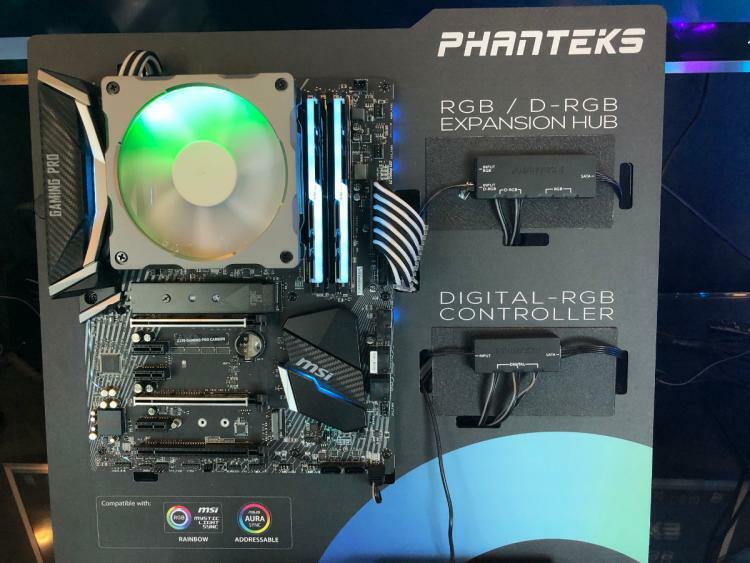 As you might expect, you can control them through the Phanteks controller, and are compatible with 5V 3-pin motherboard connectors through an included adapter. Joining the new Digital RGB accessories for 2018 are a new range of Phanteks HALOS Digital RGB fan frames. 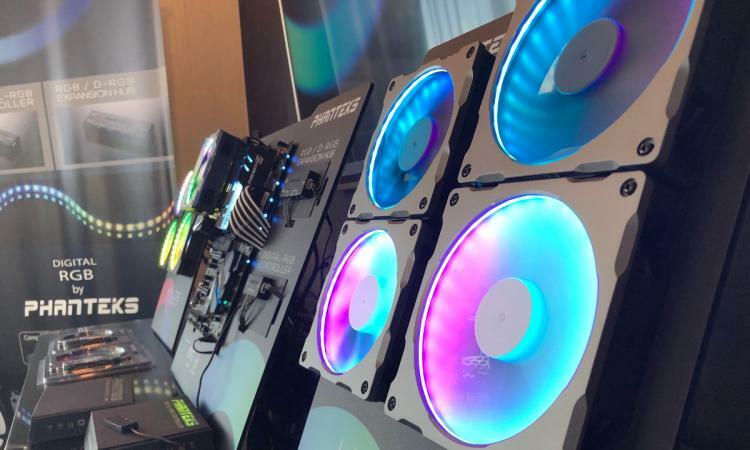 These frames have 30 individual RGB LEDs which surround the fan, producing a halo effect of even lighting which, naturally, can be controlled via the new modules. HALOS Lux Digital RGB frame variants are manufactured from a single piece of aluminium, underscoring the quality of the design. HALOS Digital RGB frames are available in 120mm or 140mm sizes, and the kits also include additional fan and radiator screws to make fitting them into all sorts of configurations a trivial matter.